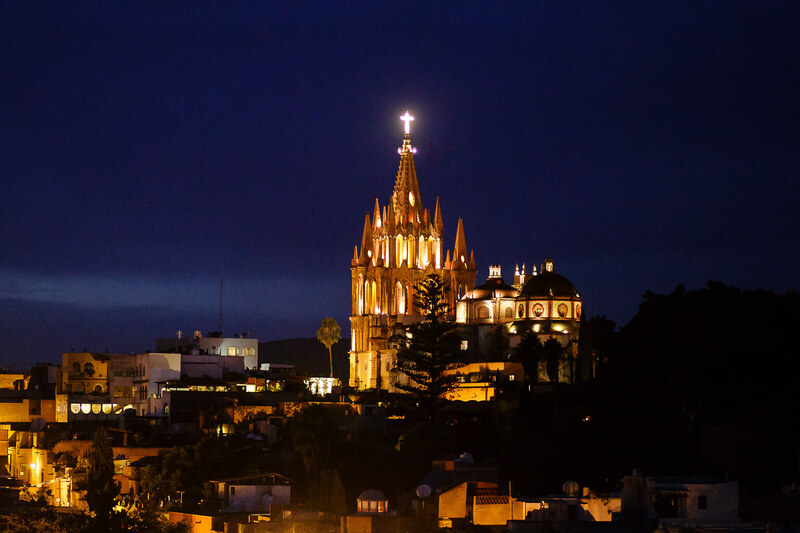 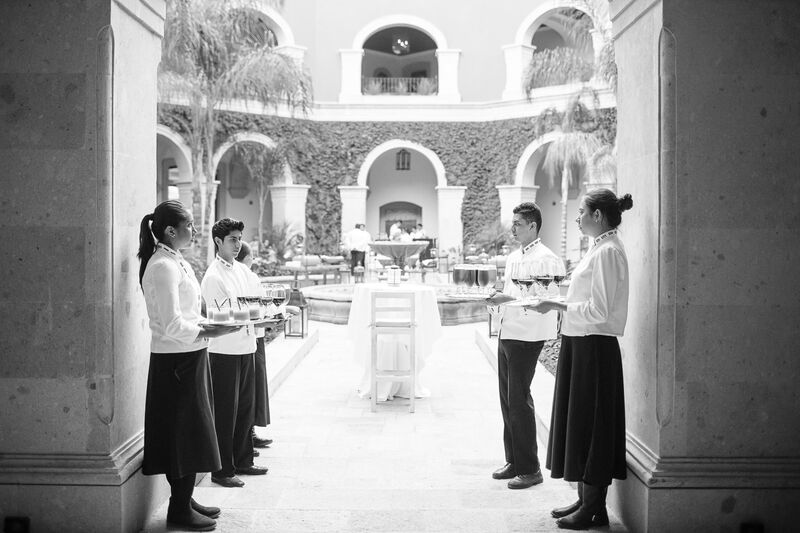 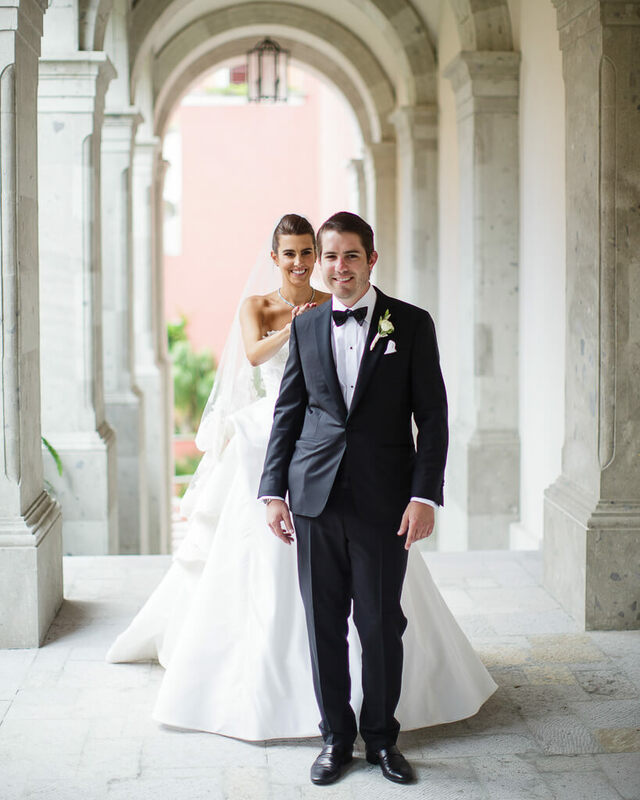 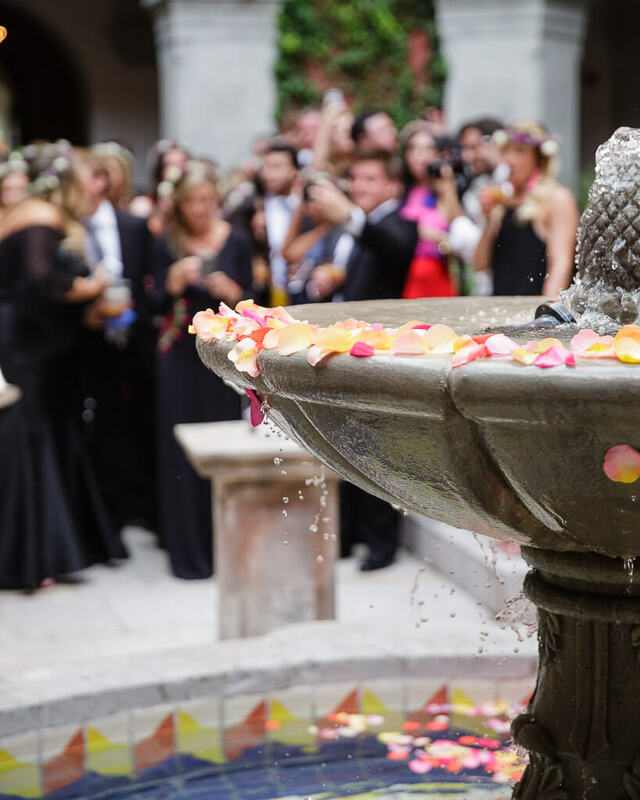 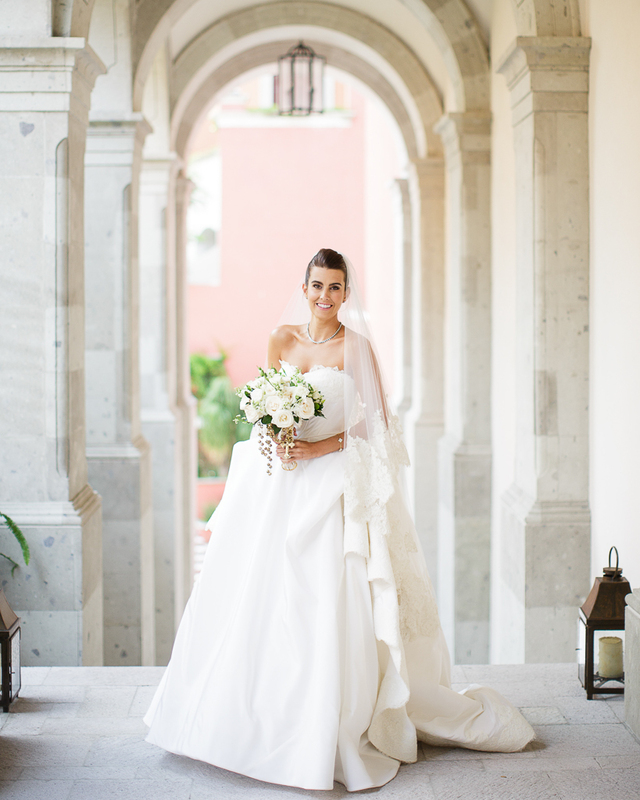 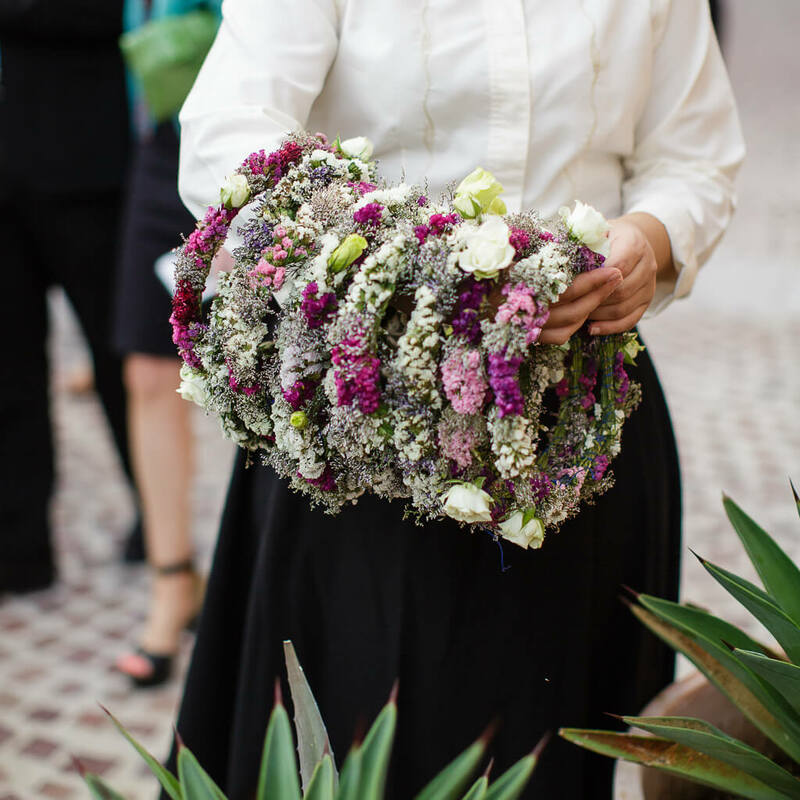 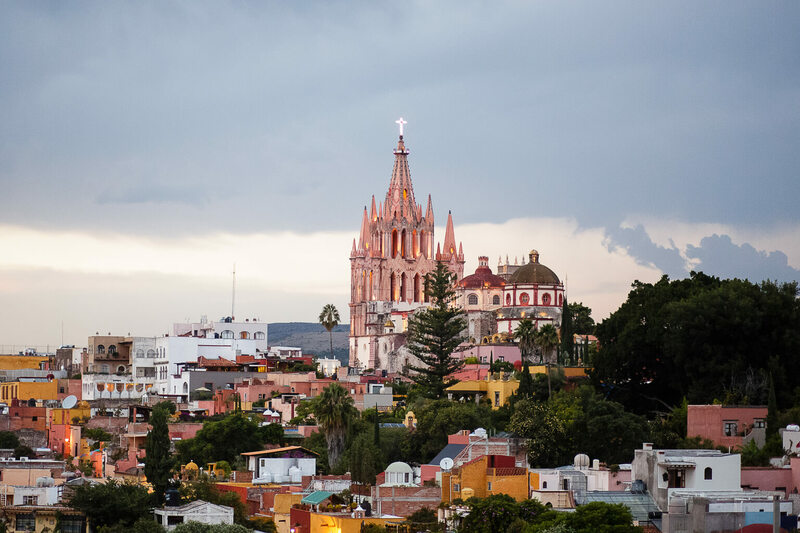 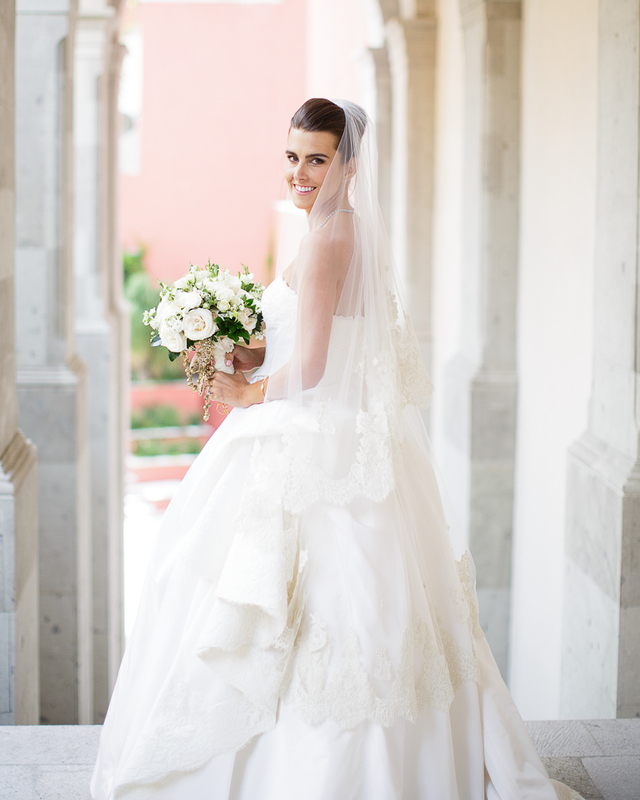 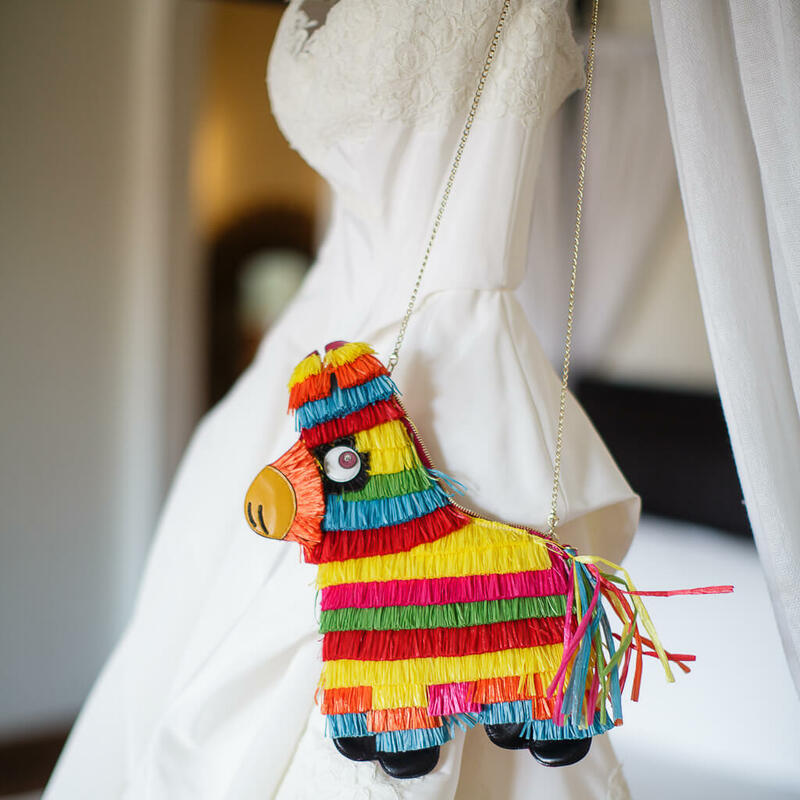 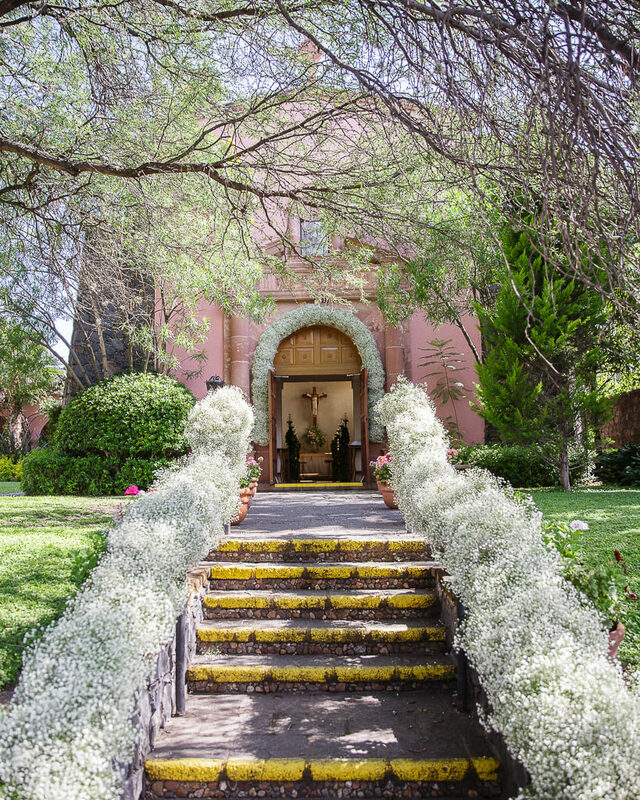 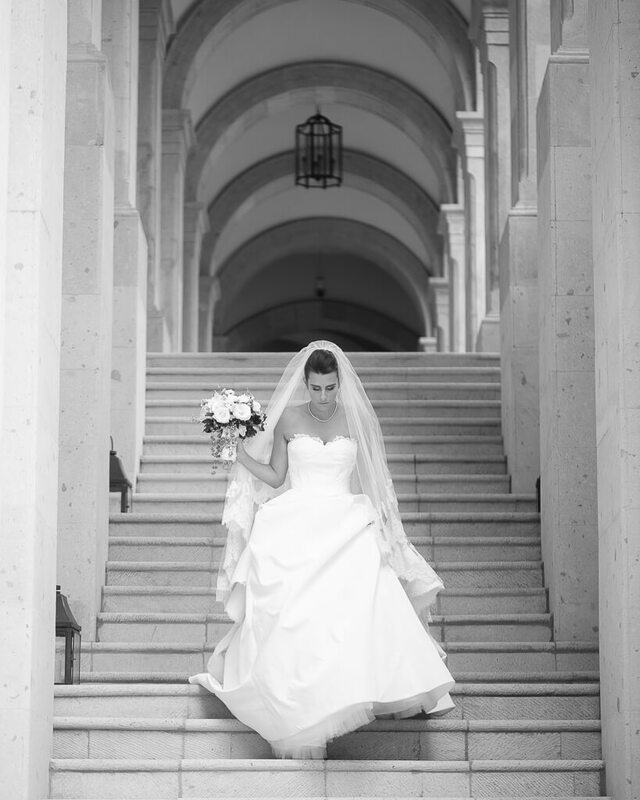 Desiring a unique wedding location, the bride and groom chose a luxury hotel in Central Mexico at which to host their nuptials. 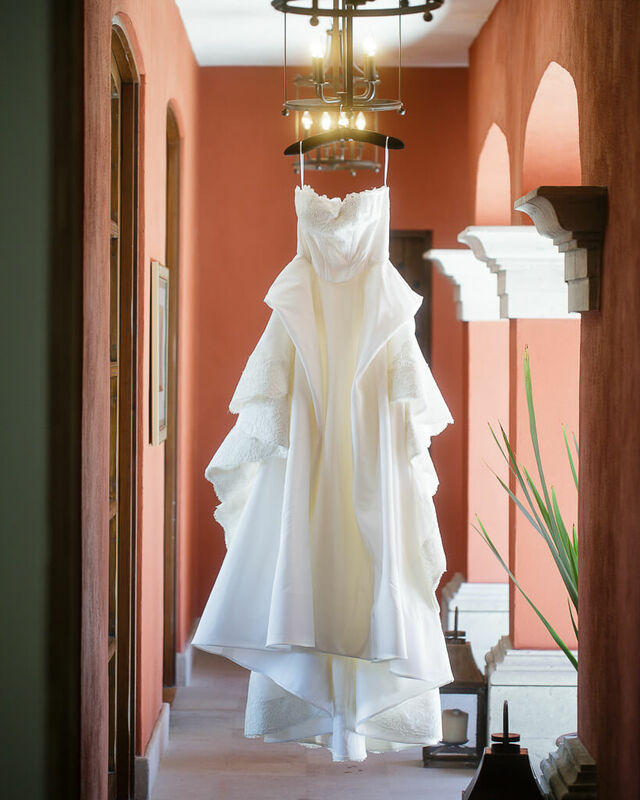 Before the ceremony, the bride prepared for the day in the bridal suite with her bridesmaids by her side. 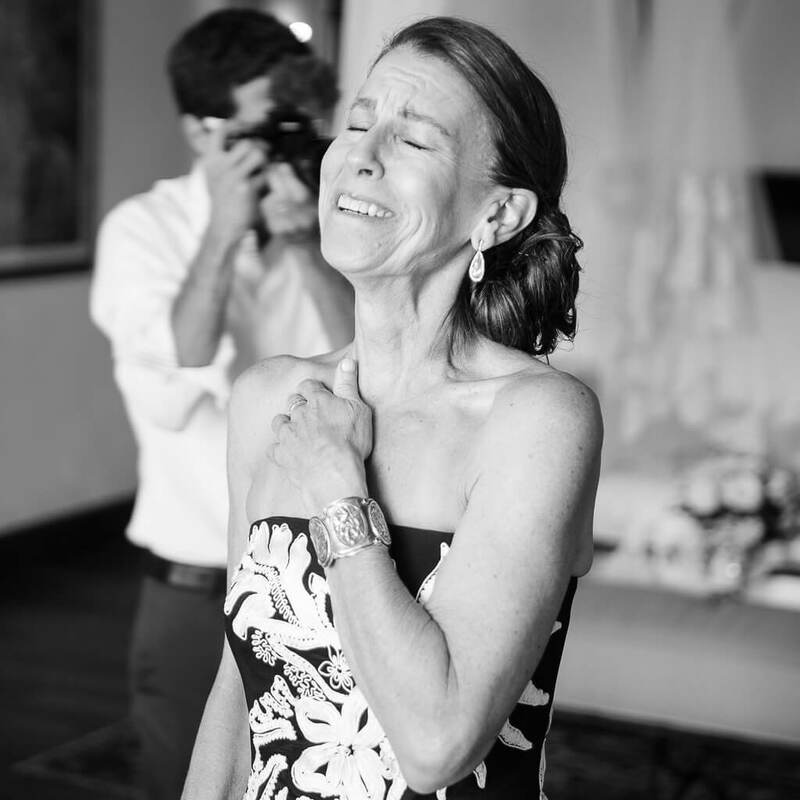 Deciding to take part in a “first look,” the couple saw one another before the ceremony, which afforded them the opportunity to take beautiful portrait images prior to the vow exchange. 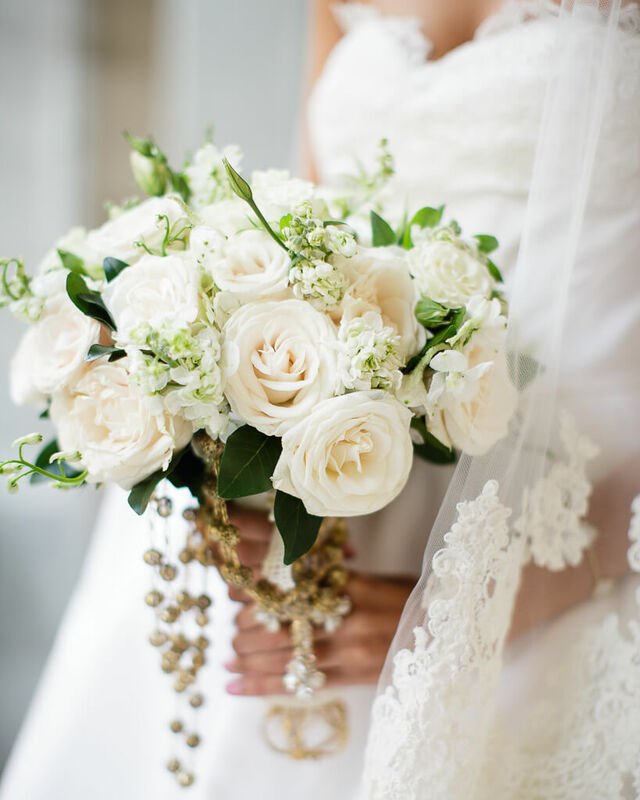 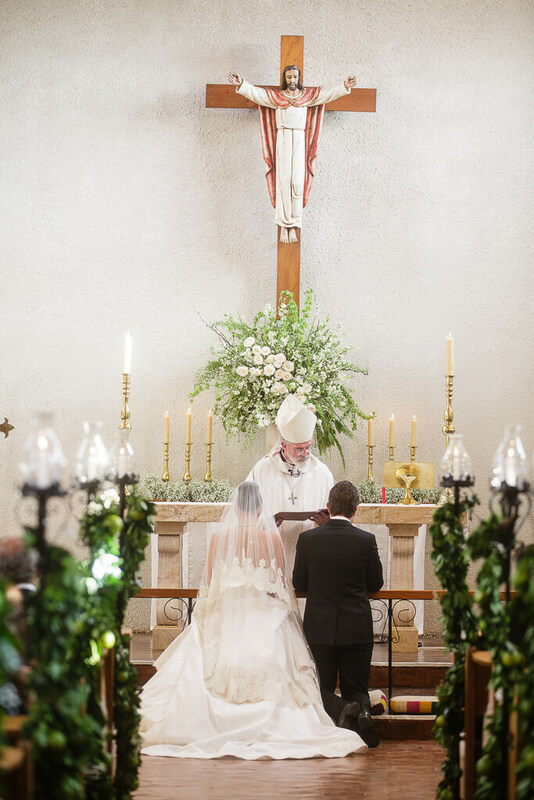 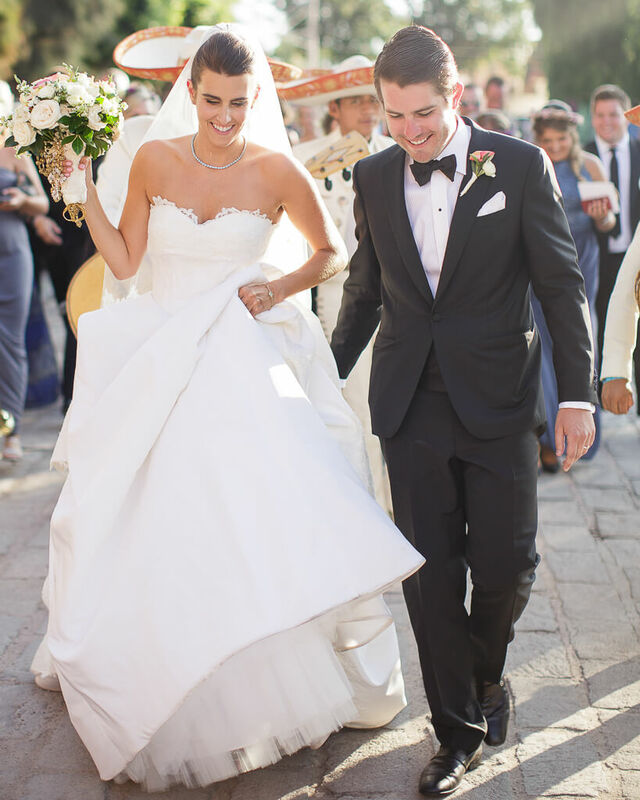 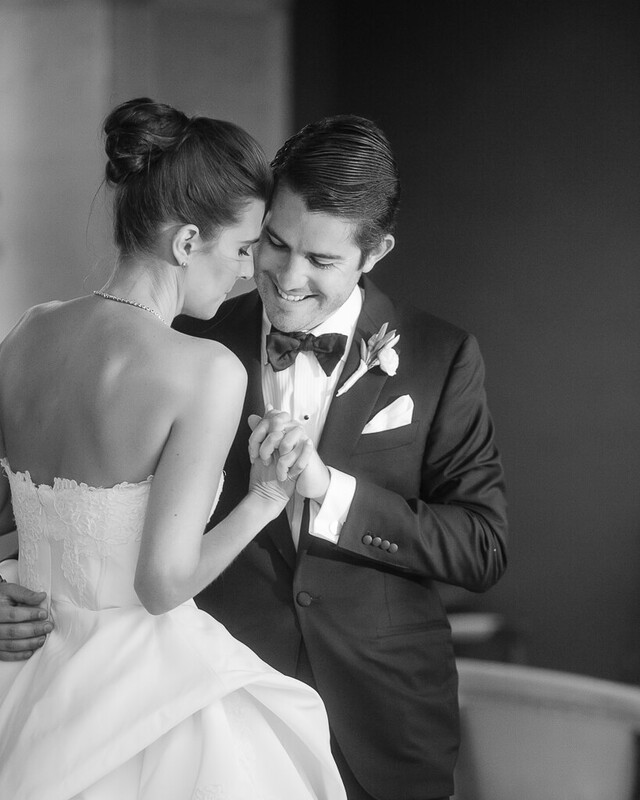 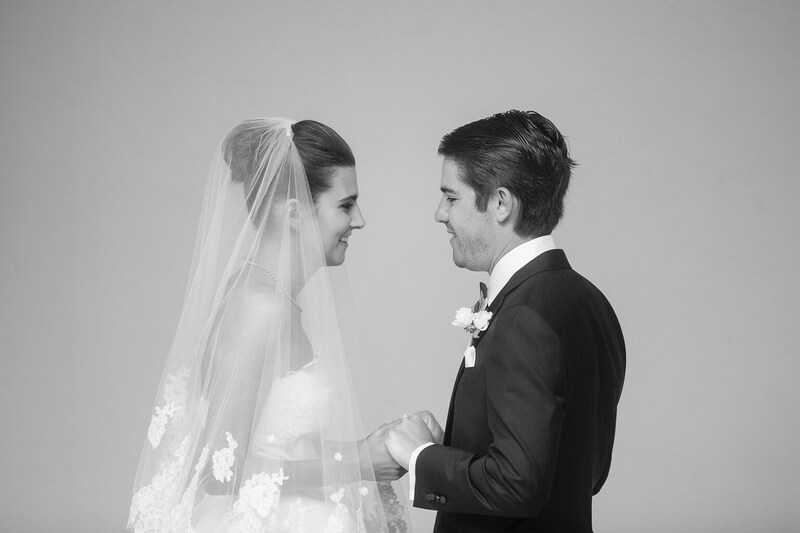 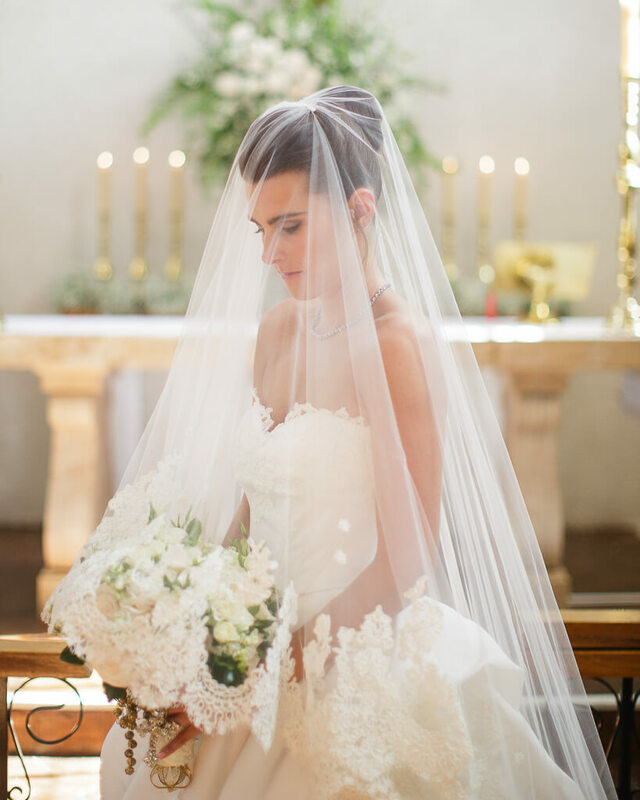 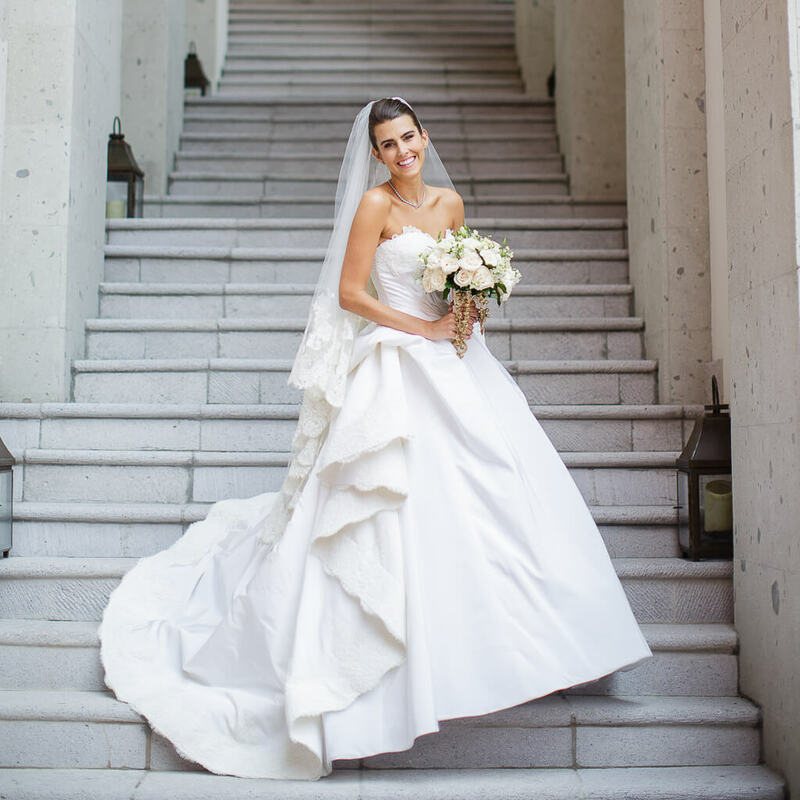 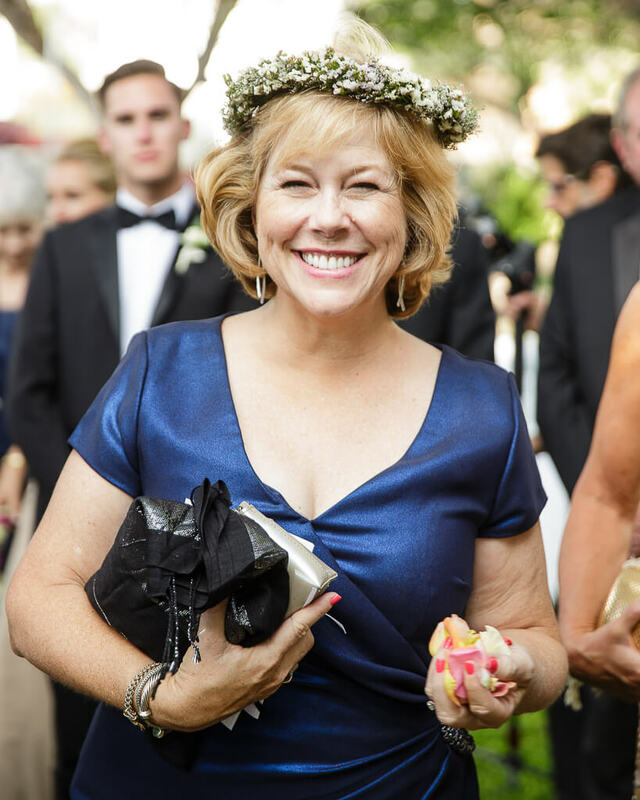 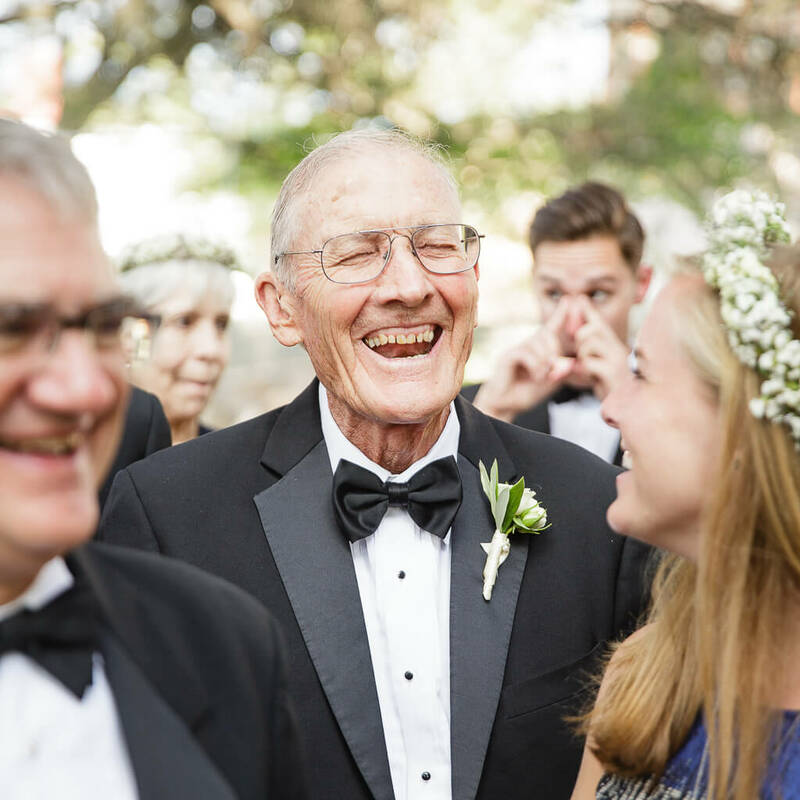 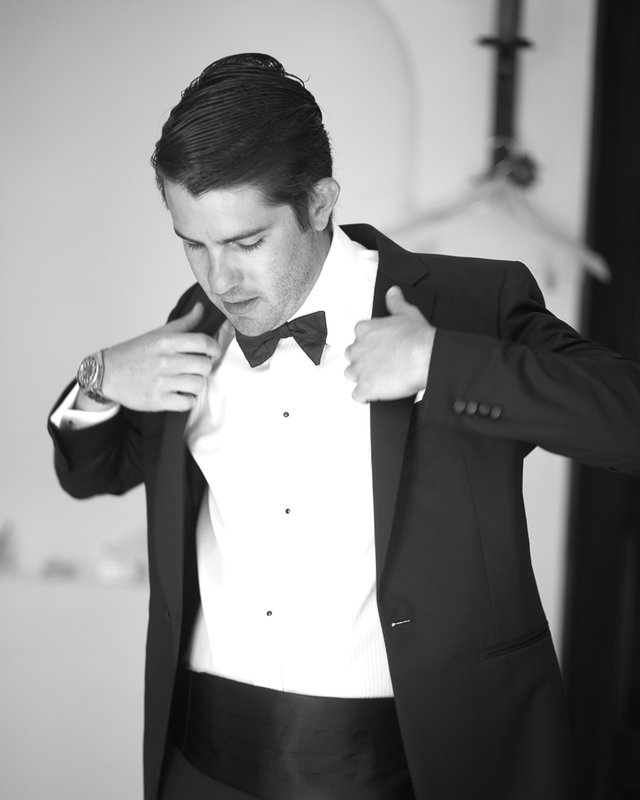 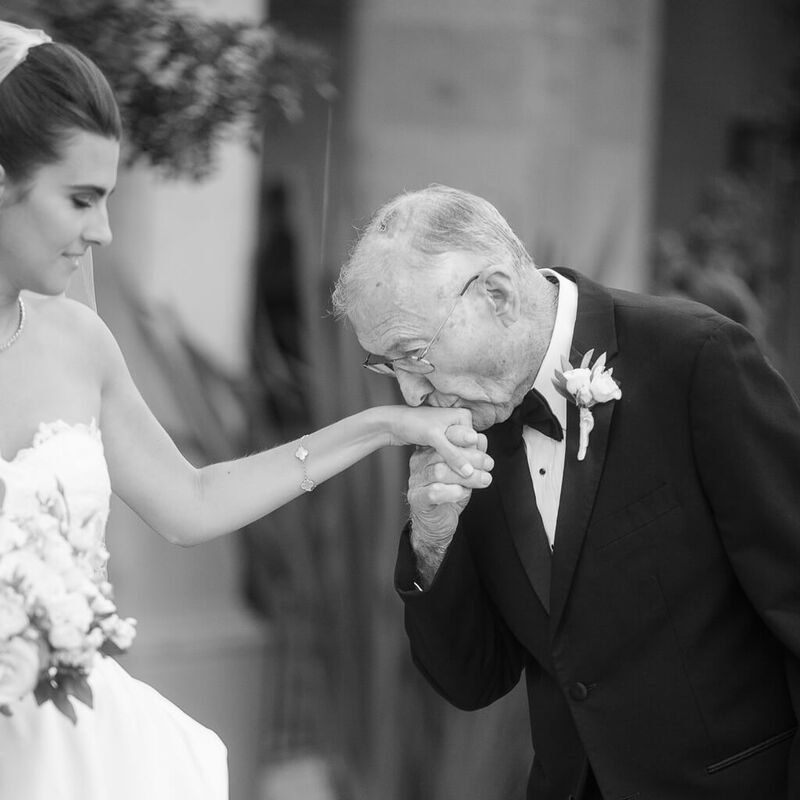 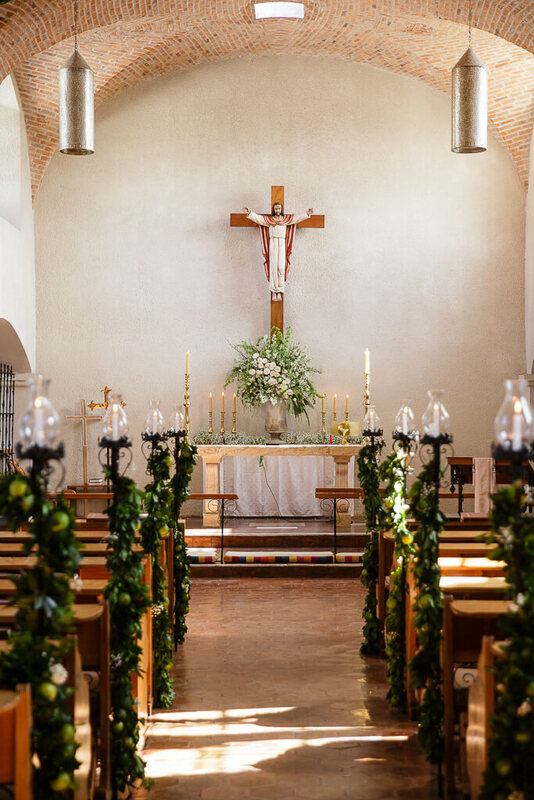 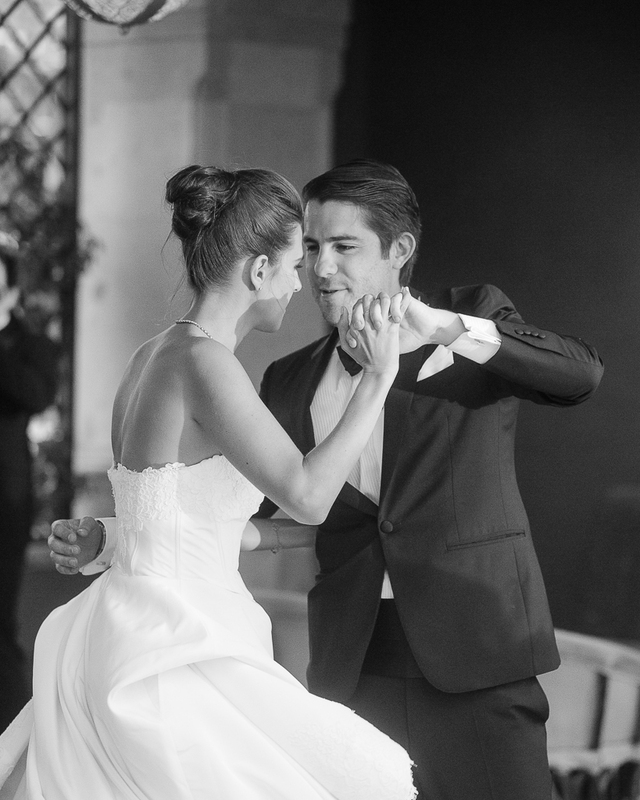 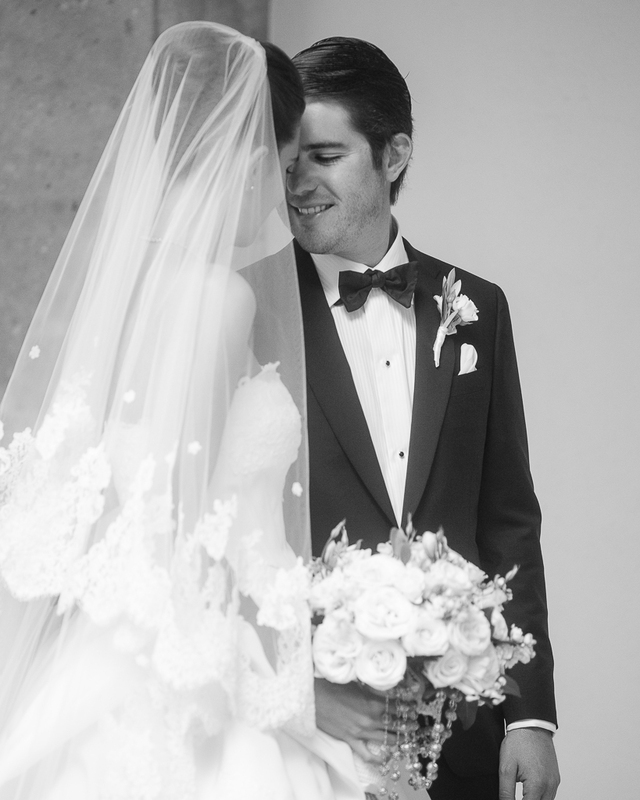 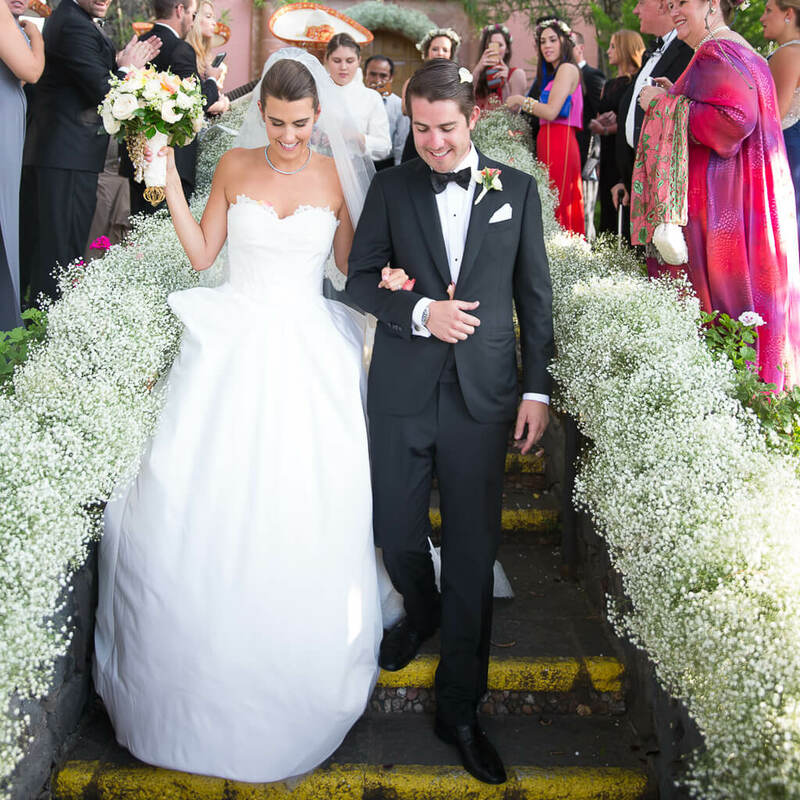 The bride was resplendent in a strapless ball gown and carried a white rose bouquet accented with light verdure and a rosary, while the groom donned a classic tuxedo and bow tie. 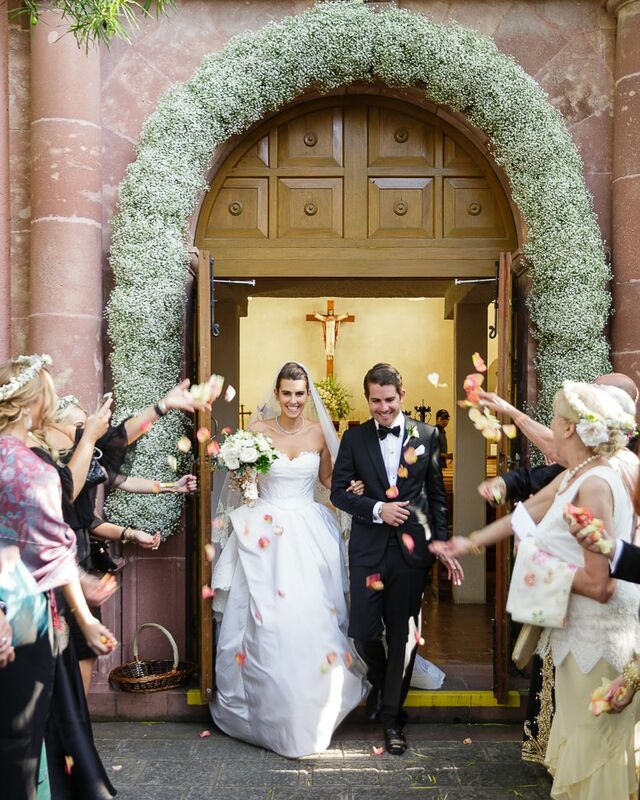 Attendees walked up the steps to the church, which were lined with lush baby’s breath blooms that also decorated the arch above the doors of the sanctuary. 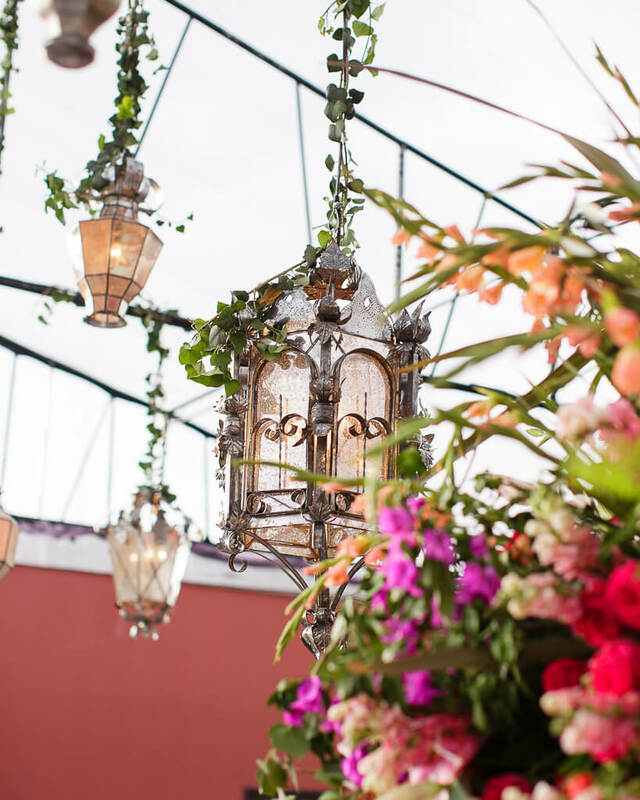 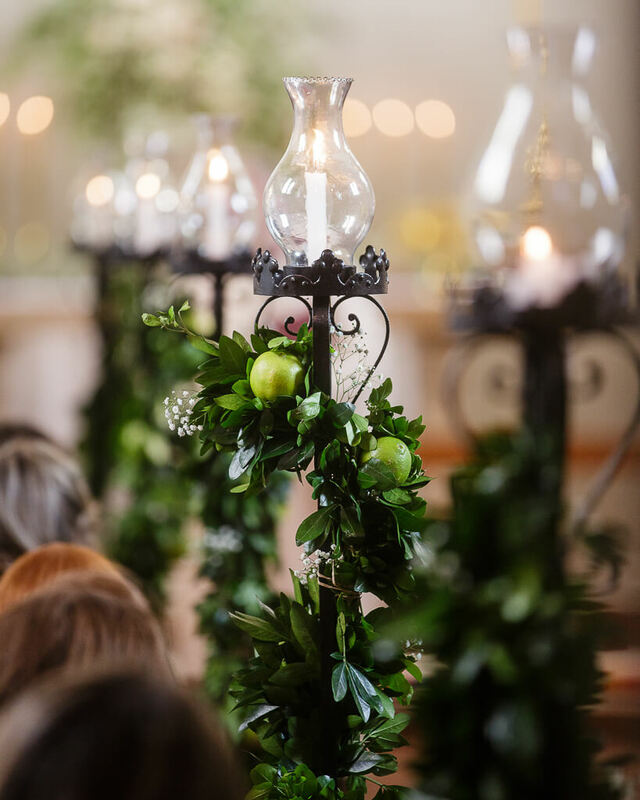 Once inside, the bride made her grand entrance down an aisle adorned with lanterns woven with garlands of greenery. 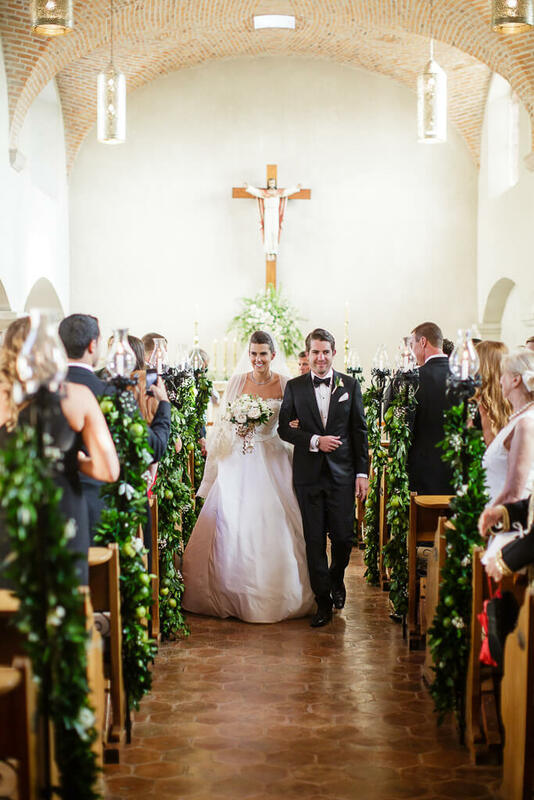 Following the Catholic ceremony and the couple’s heartfelt vows, guests tossed flower petals as they exited the house of worship arm in arm. 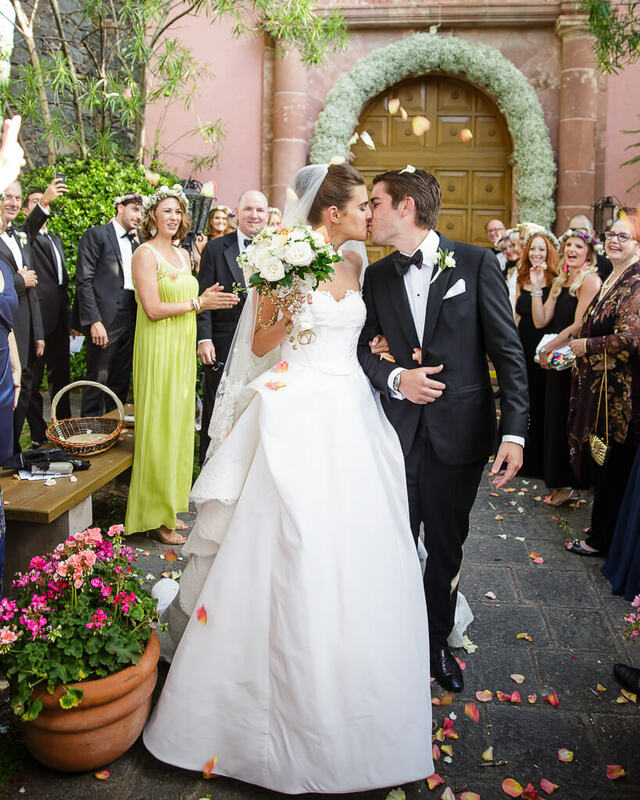 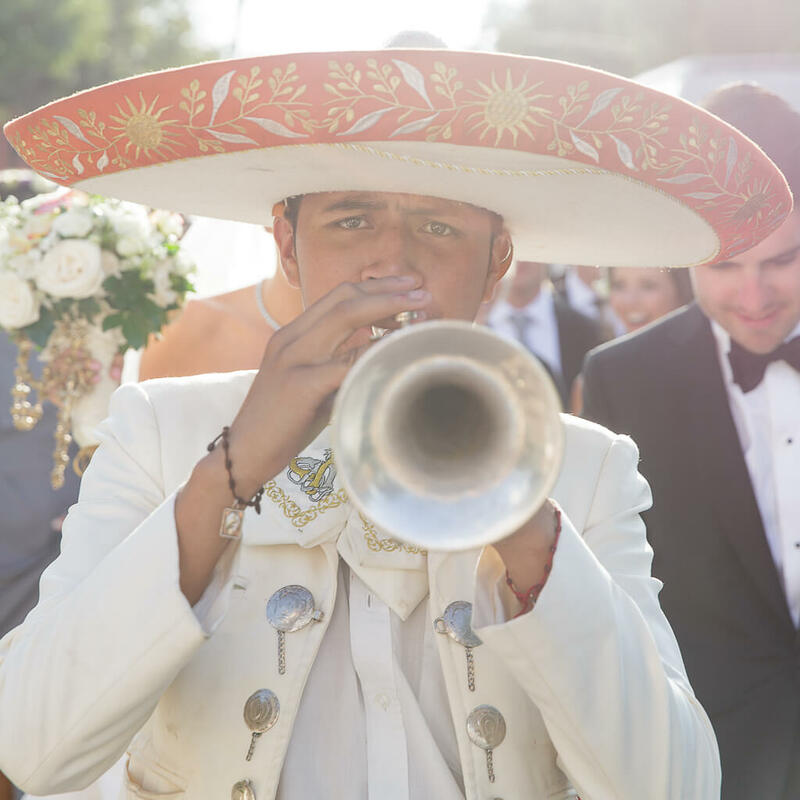 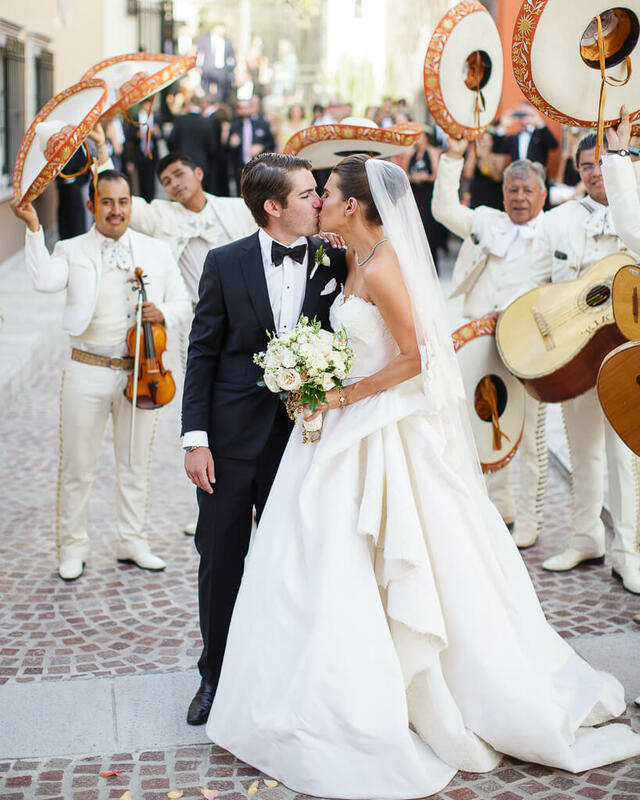 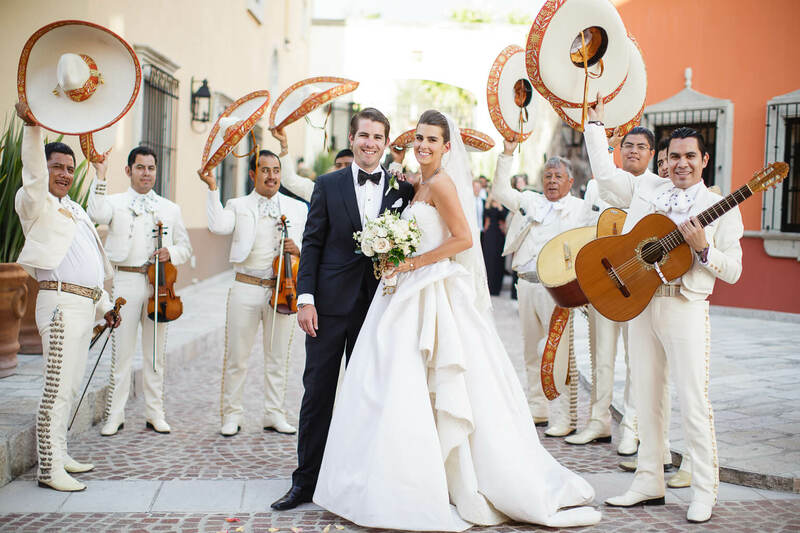 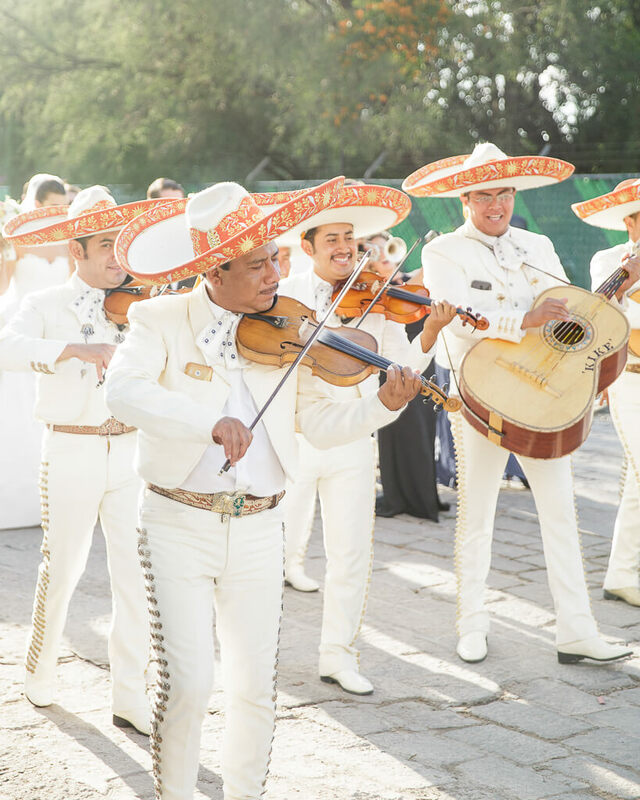 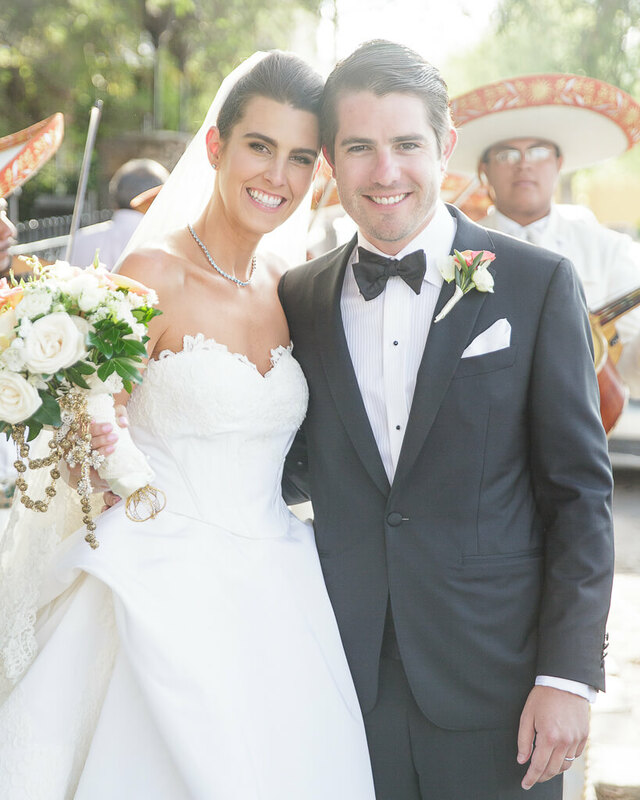 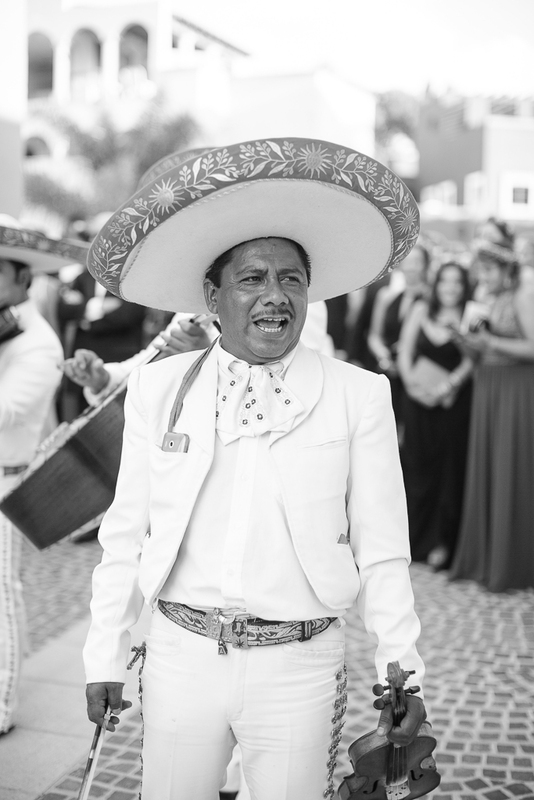 To continue the celebration, a mariachi band serenaded the newylweds and their guests in the cobblestone streets. 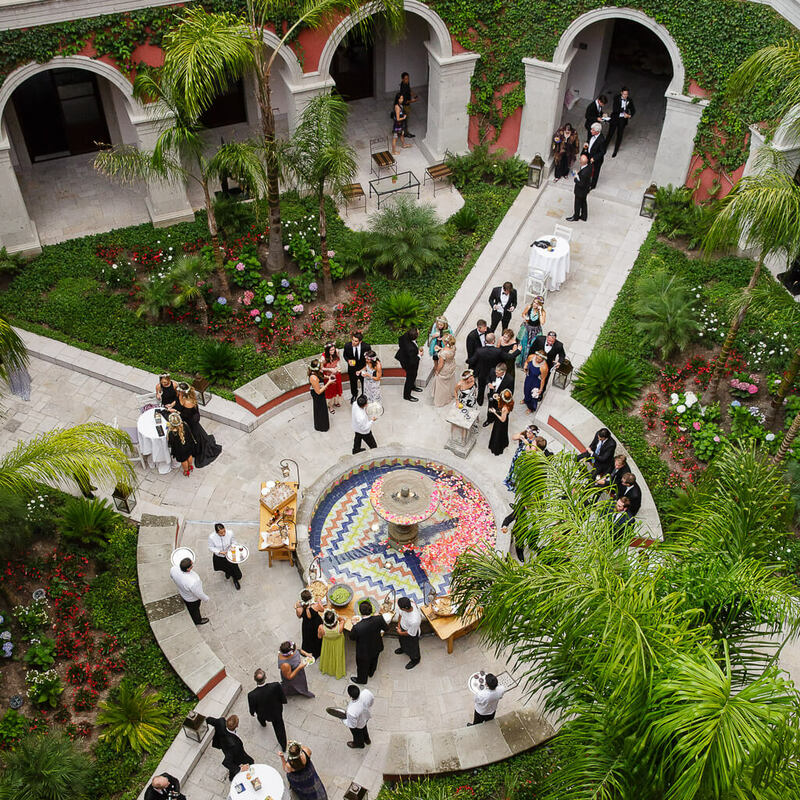 Cocktail hour took place in the courtyard, which featured a fountain in the center that was filled with brightly hued flower petals. 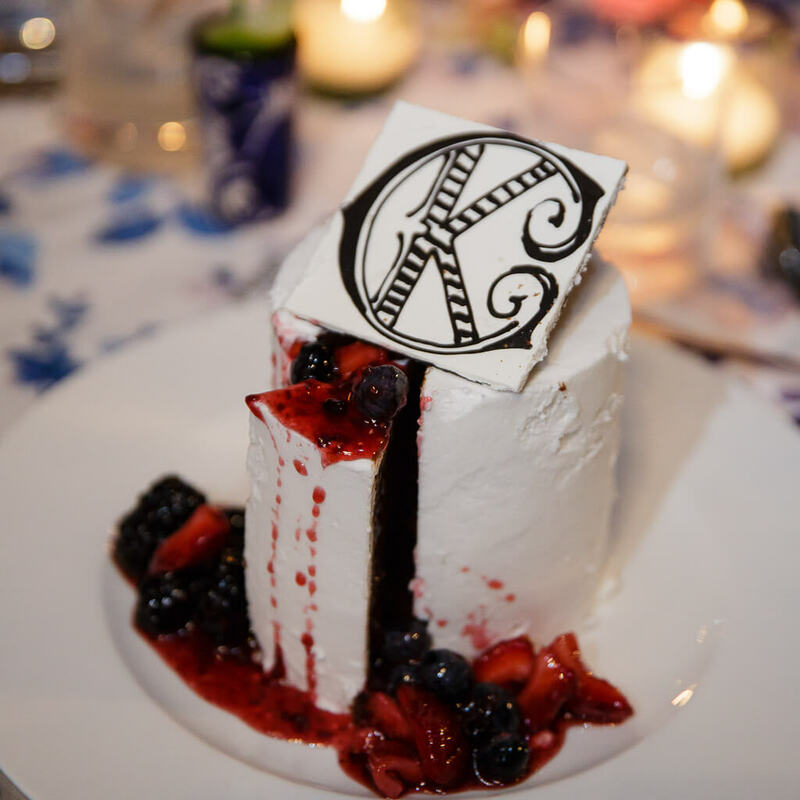 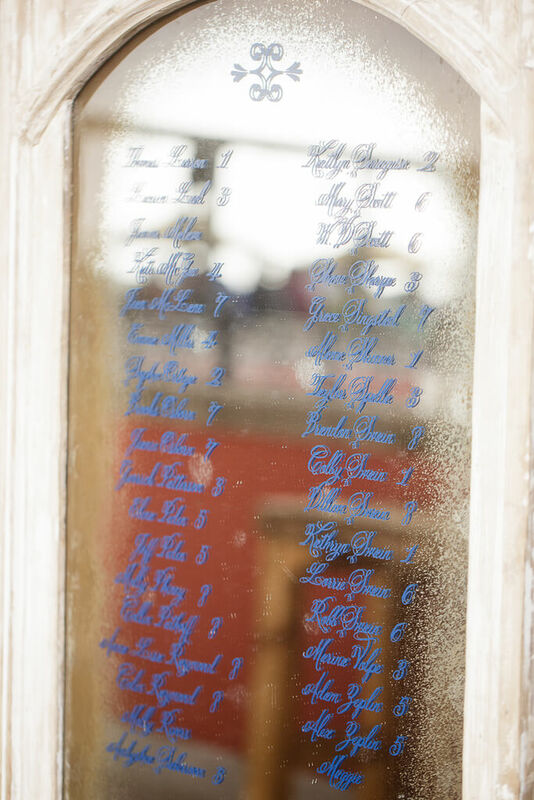 Guests then found their table numbers calligraphed on a mirrored surface and made their way into the tented reception space. 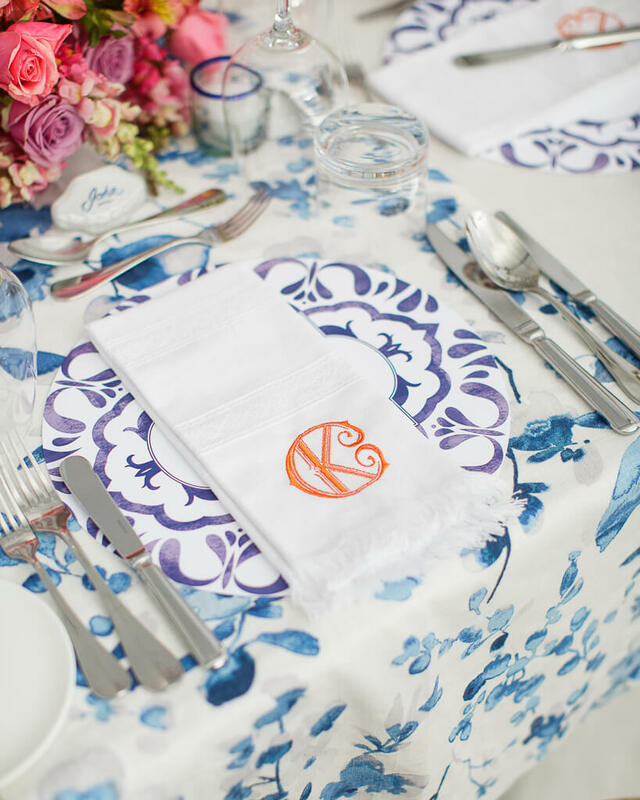 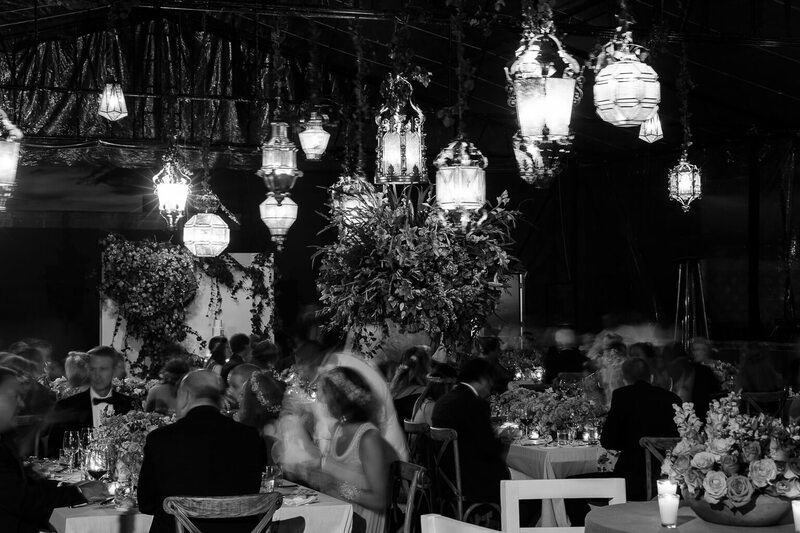 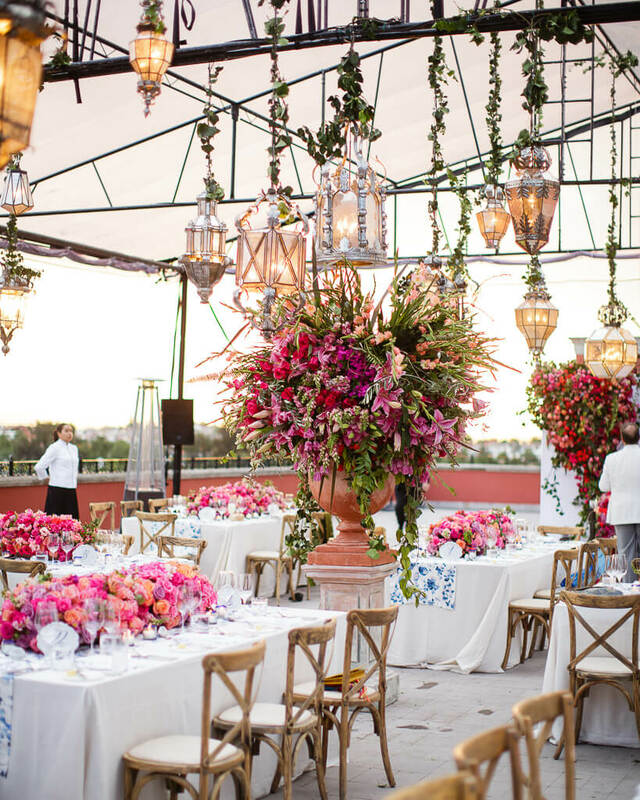 Adding a charming element to the décor, wrought-iron lanterns were suspended above guest tables, which were covered with ivory linens and blue-and-white patterned runners. 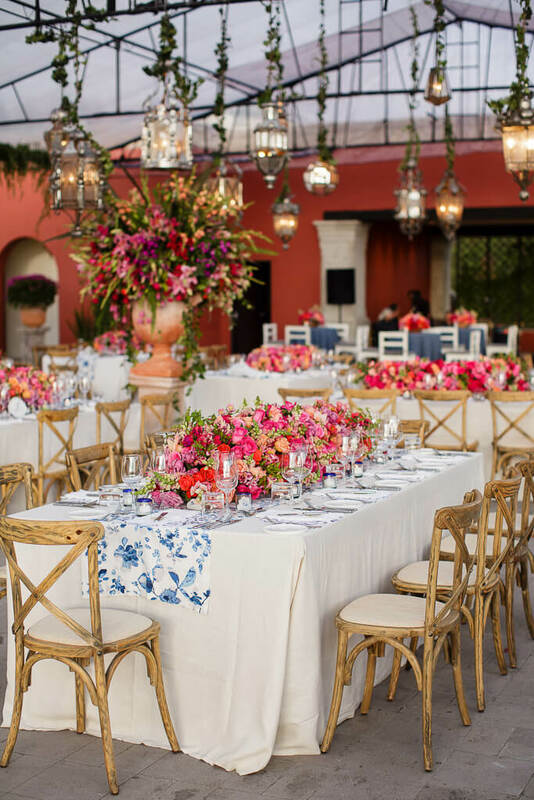 Centerpieces showcased floral runners of bright pink and tangerine roses accented with blue-rimmed glass candle votives. 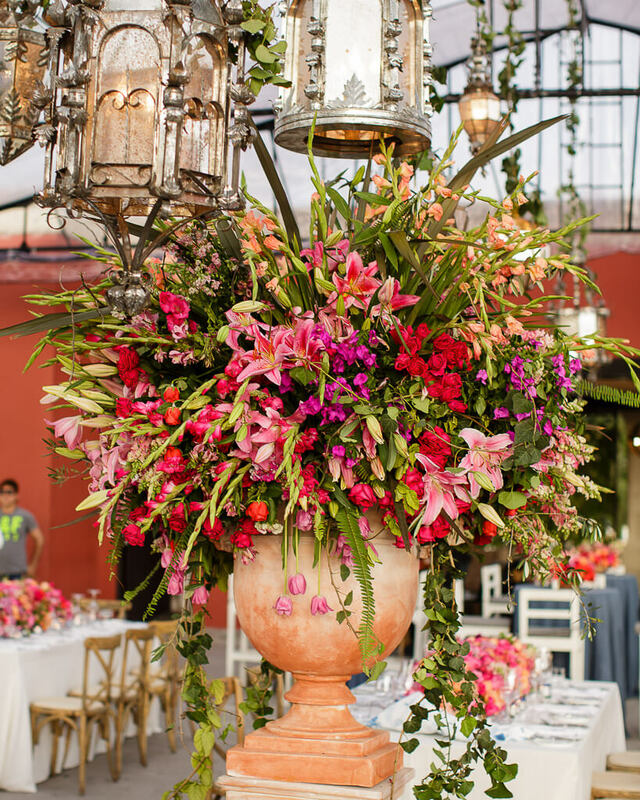 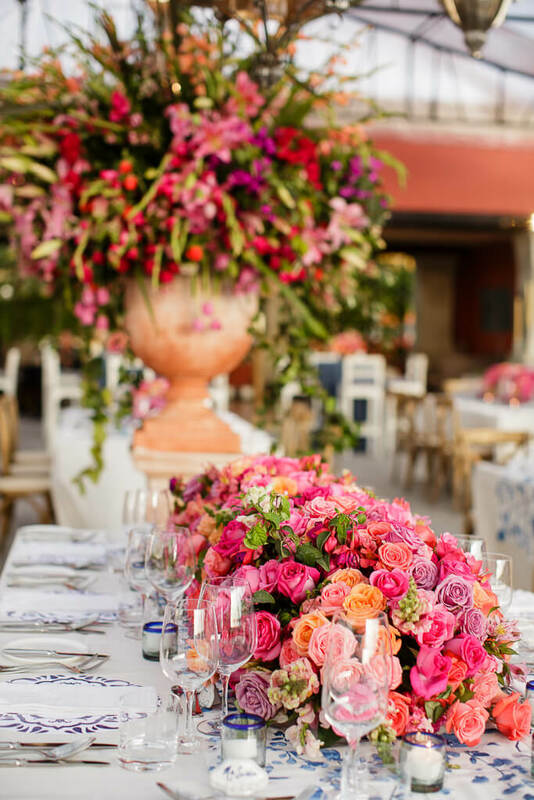 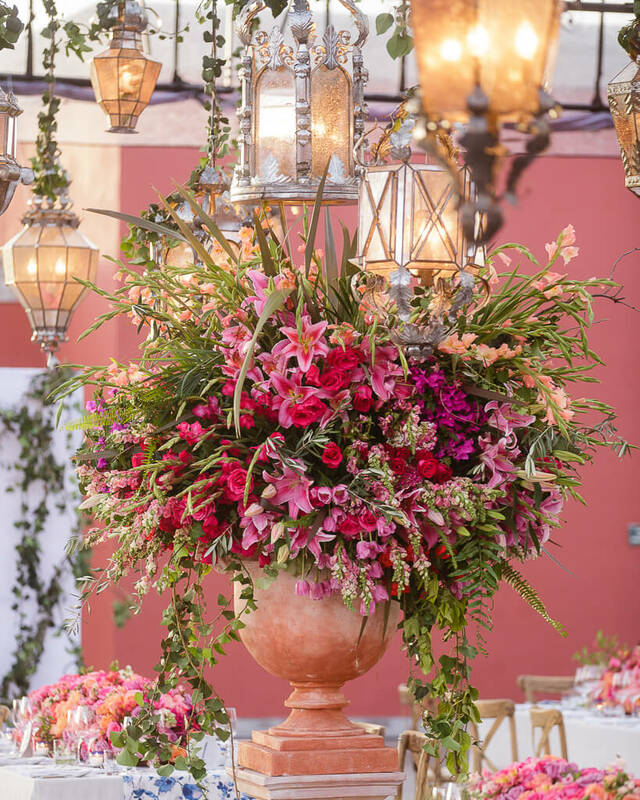 Larger arrangements of roses and lilies accented with greenery in terracotta urns were placed throughout the space. 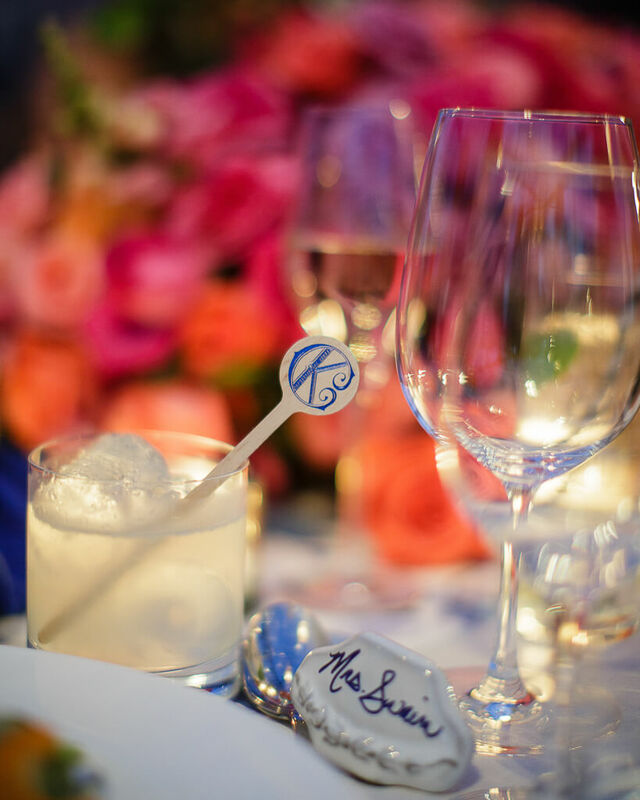 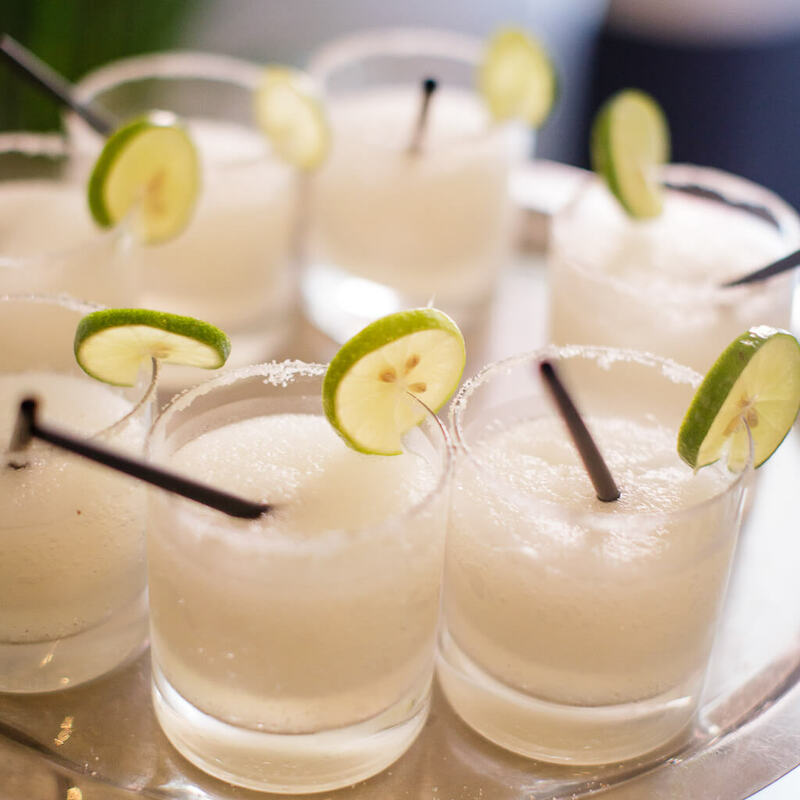 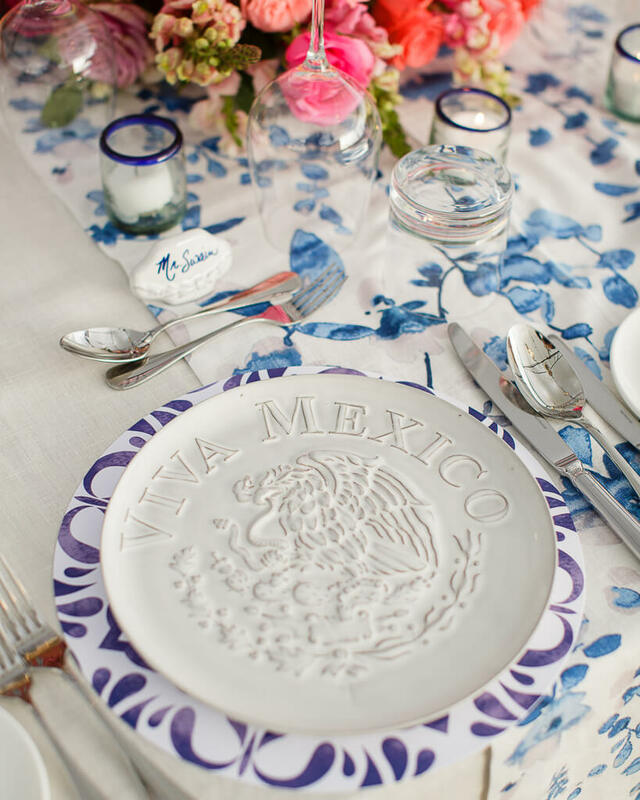 To keep the party going all night long, cocktails were served in hand-painted ceramic cups in shades of blue and white adorned with drink stirrers reading, bailemos – meaning “to dance” in Spanish. 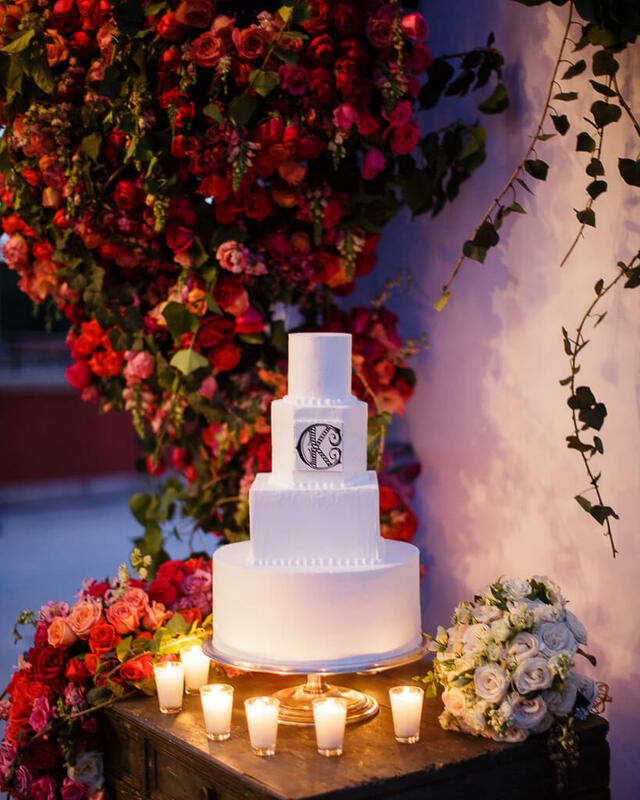 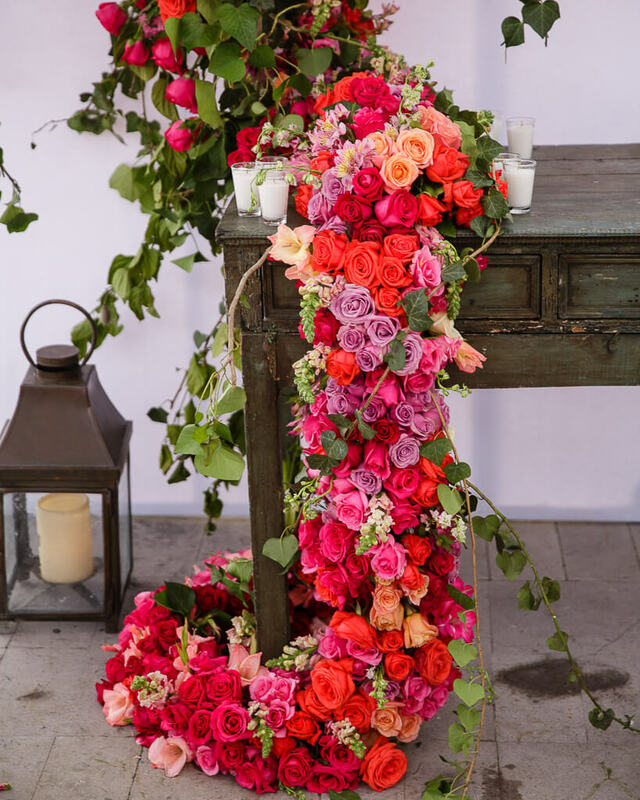 Loved ones enjoyed slices of a white four-tier confection, which was displayed on a table strewn with a floral runner of bright pink and coral blooms that spilled gracefully onto the floor. 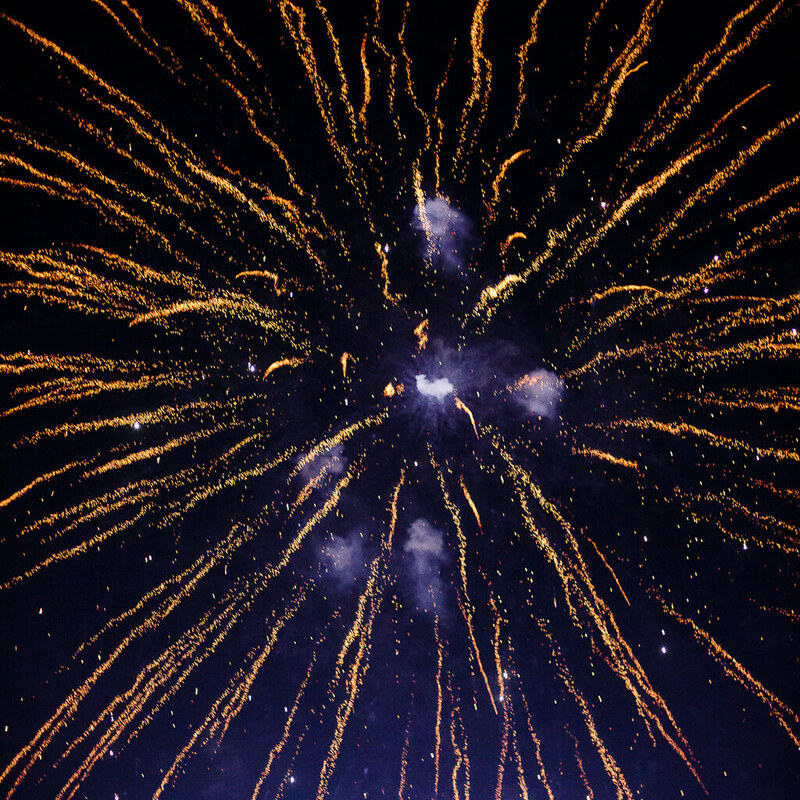 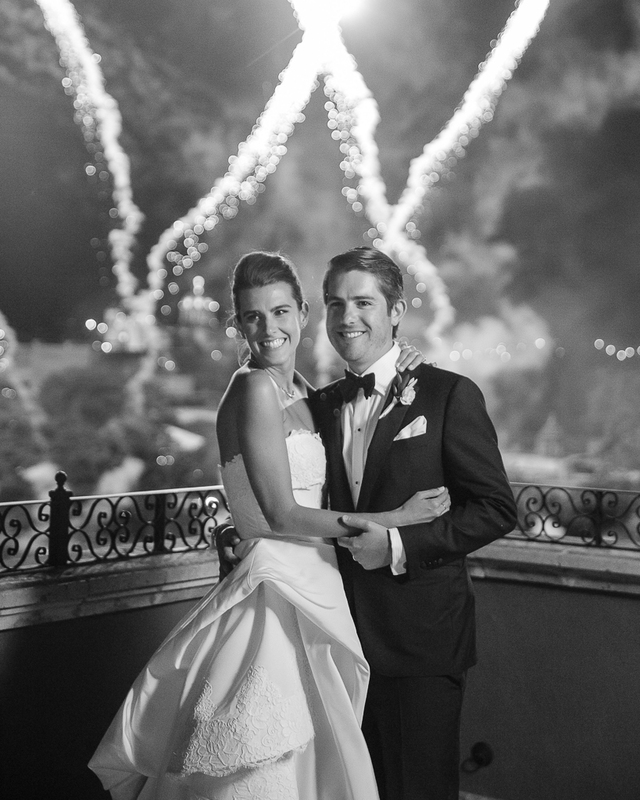 A firework show surprised attendees with a delightful end to the celebration.